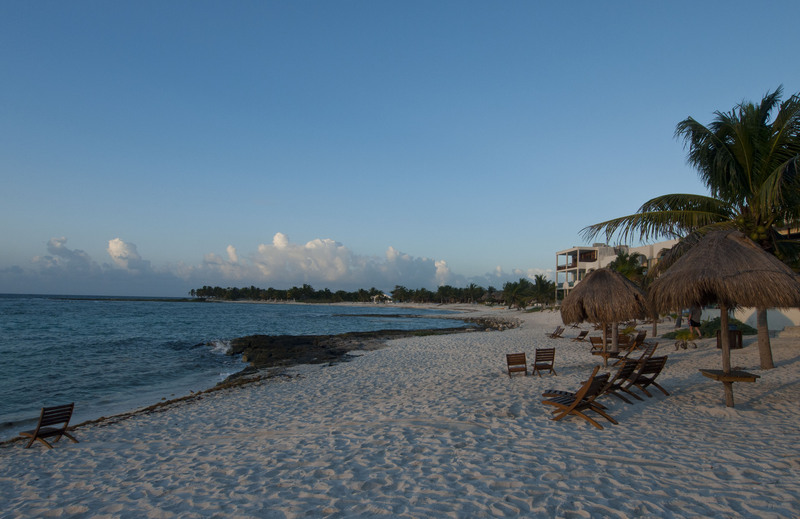 From Piste we drove into Cancun – a big town with no way to get to the water and a barrier island just off shore which was lined with big high rise hotels. To be honest it looked horrendous and we stopped off to do some shopping and then headed South towards Playa del Carmen. On the way though we stopped off at a cenote which is just outside Valladolid called Cenote de Dzitnup. (or X’Keken). 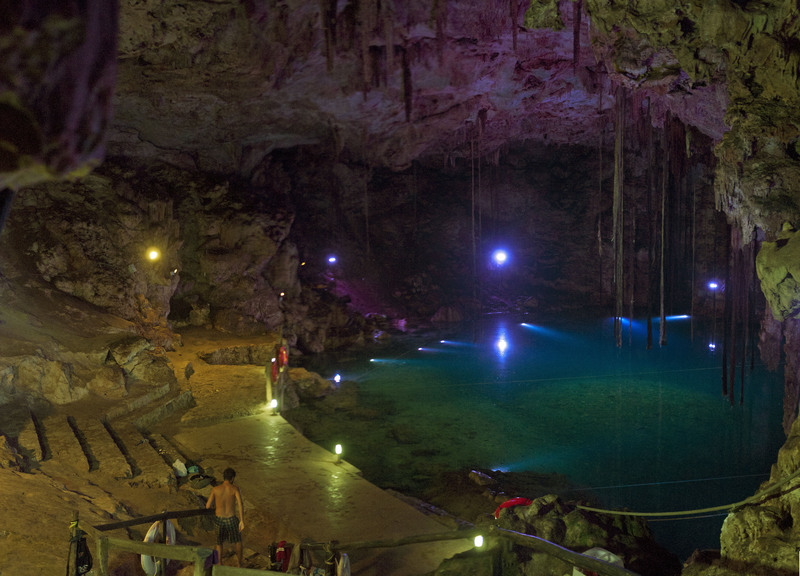 This is a cenote (an underground lake basically) which is still completely underground. There is a small hole in the roof which lets some light in but the cavern is mostly lit by artificial, unfortunately coloured lights that spoil it a bit. 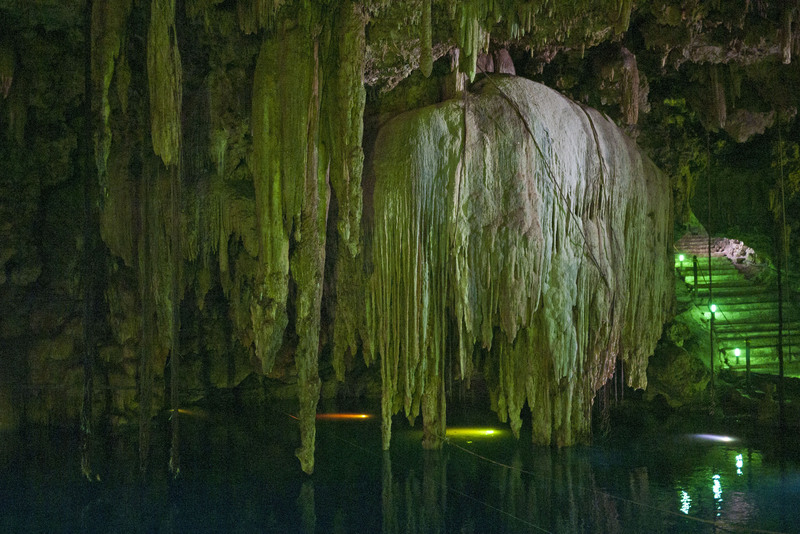 We went swimming in the cave and you can swim right under some of the hanging stalactites. There are some small fish in the water and roots from the trees on the surface hanging right down into the water – some 50 feet. 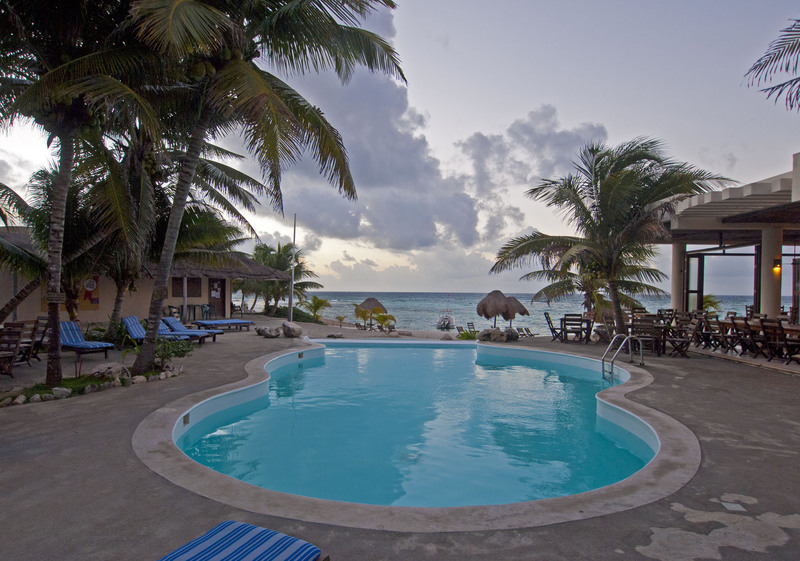 Just South of Playa Del Carmen is an RV Park, Paa Mul, which is mostly inhabited by permanents. Many of these have built cabanas around their RV’s to such an extent that it is really hard to tell there is an RV in there. The spots for travellers are really just car park spaces although there was a bit of shade. We were quite aggrieved at the price which was US40 per night which didn’t include WIFI (only available on a monthly basis for 450 pesos/month). We quickly discovered after lighting our BBQ for dinner that this was not allowed and we were told we had to extinguish it. We were feeling pretty ripped off by this stage. However there is a really nice infinity pool at the RV Park and a restaurant which was pretty nice. There is a sandy beach and of course the Caribbean sea. For me the saving grace was an onsite dive shop. We decided to spend a couple of days here and the first day we spent chilling out. Sarah lay on her newly bought hammock and we relaxed a bit after a hectic couple of weeks. On the second day I was determined to do some diving though !